As a costly and controversial public art project reaches its final vote for funding at the Iowa City council meeting next Tuesday, a game-changing "solar tree" public art initiative launched by the 100 Grannies for a Livable Future has galvanized a groundswell of support for a more community-based, inclusive and environmentally focused alternative that could serve as a public art model for other American cities. Incorporating the original purpose of the Black Hawk Mini Park to serve as "guardians of the land," and as a hands-on follow-up to Iowa City's recent commitment to the Compact of Mayor's climate agreement, the 100 Grannies' proposal is based on the globally acclaimed "Energy Tree" in Bristol, England's central Millennium Square, which combines "community collaboration, artistic excellence, and science in a public art installation and renewable power source designed to engage the public in energy issues and address social inequality." "Iowa City has a golden opportunity to lead the way toward a livable future," said Miriam Kashia, a 100 Grannies member and nationally known climate activist. "Rather than the controversial, non-local, expensive 'Lens' sculpture, we can create a community inspired and beautiful 'Giving Energy Tree' that serves all of us and reminds us daily of the future we can believe in and work toward." 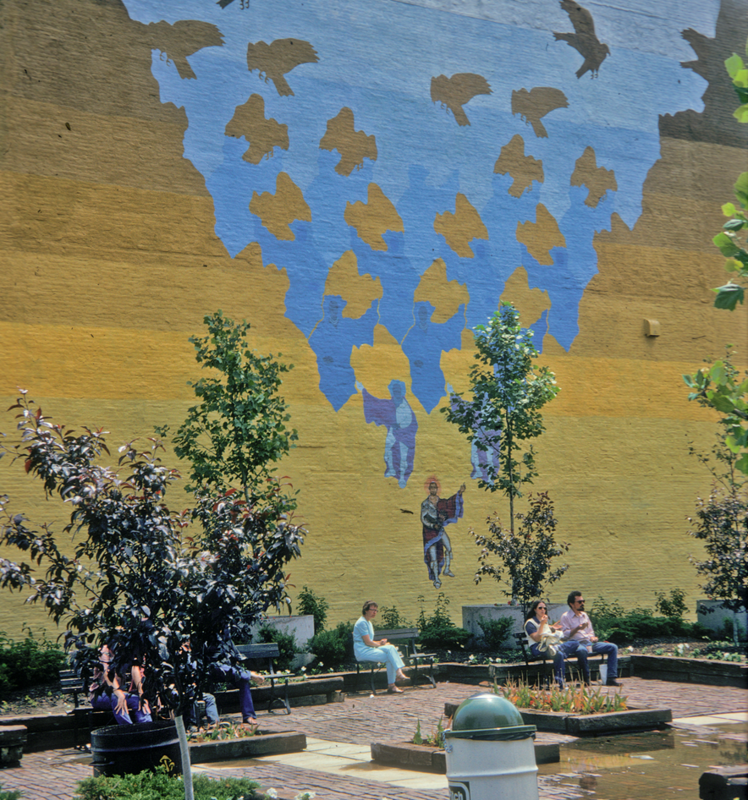 "All public art is a political statement," added Dianne Dillon-Ridgley, a long-time Iowa City resident and environmental justice leader. "As Helen Lewis says, 'The best marks a rich changing society.' Iowa City prides itself as a UNESCO City of Literature, a City of Culture with the history of being an early Capital of Iowa. I would hope such a major defining work of public art would speak to and honor Iowa's past (the Meskwakie and Black Hawk's Sauk) and aspire to Iowa City's future as a vibrant visionary community...a work in the service of the people, symbolic, narrative and aspiring of the future Iowa City, where we grow trees of knowledge, trees of literature, and living trees of sustainability!" Instead of allocating $50,000 to hire a private fundraiser for the current "Lens" sculpture, which carries a $500,000 price tag, the 100 Grannies and other community members are proposing to use such city funds to hire local artists and engineers or former University of Iowa solar artist Anthony Castronovo, whose nationally acclaimed "After Trillium" solar sculpture is on display at the Iowa River Landing, to work with students and at-risk youth, as part of a larger fundraising campaign that celebrates community-based public art in an age of climate change. While the current public art selection of the "Lens" has emerged from an 18-month process, its level of controversy among the community and a shift in the city council from recent elections have opened a new discussion on the role of the public commons and downtown Black Hawk Mini Park. The 100 Grannies' proposal also pays tribute to the recent passing of their founder, the Rev. Barbara Schlachter, "to honor a heroic woman who touched many people in many ways, both in Iowa City and across the nation." According to John Packer, the designer and artist behind the Energy Tree in Bristol, "A tree is a metaphor, a playful metaphor - all trees are solar trees. Hopefully [the tree] can plant a seed-thought about where our energy comes from, and why we rely so much on fossil fuels." 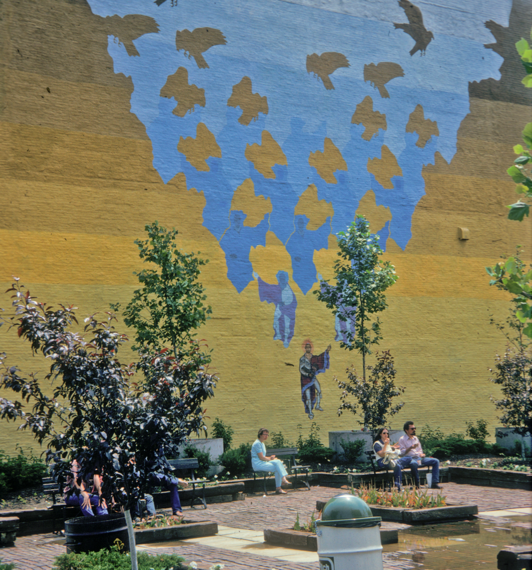 The "Spirit of Black Hawk" mural and namesake for Iowa City's downtown square, according to the Free Environment group in 1975, "reminds us that the guardians of this land who came before us treated it with more respect than we do." As Iowa City's leaders and many citizens are working hard to make our community a leader in sustainability, members of 100Grannies for a Livable Future are baffled that in the selection of an art piece for the Ped Mall, there seems to have been no environmental considerations. $500,000 for The Lens, proposed for Black Hawk Mini Park, seems a considerable amount of money that could be put to better use, for instance in a project that reflects local values and creativity. On behalf of 100Grannies, I am proposing, instead, the type of sculpture I saw in Bristol, England, a few weeks ago. It is a wonderful "Energy Tree," constructed with multi-directional solar panels for 'leaves' and eight 'roots' that enclose power points for recharging mobile phones. Bristol was the European Union's Green Capital City last year, the first with that designation in the UK. As many of you know, 100Grannies members are mourning the recent death of our remarkable founder and leader, Barbara Schlachter. As we began brainstorming to identify a suitable permanent, visionary memorial to Barbara, the Energy Tree crossed our path. The Bristol energy tree is described as "a public art installation and renewable power source designed to engage the public in energy issues." Its construction in Bristol's central Millennium Square (very similar to our Ped Mall but much larger) combined "community collaboration, artistic excellence, science and grass-roots energy activism in a unique project." The community collaboration included recovering drug and alcohol abusers who learned in workshops to fabricate the solar panels. Besides free phone charging, the 20-foot tree offers wi-fi. The designer and builder of the tree was John Packer, a local artist. We propose that instead of The Lens, this community get behind a more suitable alternative, an Energy Tree to honor Barbara, a heroic woman who touched many people in many ways, both in Iowa City and across the nation. It is our hope that funding will be achieved through private donations and sponsorships. The Energy Tree is a functional art piece that can be accomplished at far less cost than The Lens, probably well under $100,000. The solar cells are made from recycled fragments of broken panels that would otherwise have gone to waste. Perhaps a design competition could be held. The winning design could become a UI engineering school project. Social services clients or at-risk youth taught by Kirkwood instructors could handle panel fabrication. School children could be involved through lessons on energy. We invite those readers who view the Energy Tree as a desirable alternative to The Lens to join us at the City Council Meeting Tuesday, March 1, at 7:00 p.m. where we will introduce this proposal. For more information on Bristol's Solar Tree, go to http://www.demandenergyequality.org/energy-tree-2015.html. The site includes a five-minute video on planning and construction.